Sections 3 and 4 of the Twenty-Fifth Amendment to the U.S. Constitution provide for presidential disability or inability. Section 3 of the amendment sets the procedure whereby a President may declare himself or herself “unable to discharge the powers and duties” of the office by transmitting a written declaration to this effect to the President pro tempore of the Senate (President pro tem) and the Speaker of the House of Representatives (Speaker). For the duration of the disability, the Vice President discharges the President’s powers and duties as Acting President. When the President transmits “a written declaration to the contrary” to the President pro tem and the Speaker, he or she resumes the powers and duties of the office. Section 3 is intended to cover either unanticipated disability, such as injury or illness, or anticipated disability, such as medical treatment. It has been activated three times under circumstances in which the President underwent general anesthesia for medical treatment. It was informally implemented by President Ronald Reagan in 1985 and was formally implemented twice by President George W. Bush, in 2002 and 2007, under similar circumstances. Section 4 provides for instances of contingent presidential disability. It was intended by the Twenty-Fifth Amendment’s authors to provide for cases in which a President was unable or unwilling to declare a disability. In these circumstances, the section authorizes the Vice President and a majority of either the Cabinet, or such other body established by law (a presidential disability review body), acting jointly, to declare the President to be disabled. When they transmit a written message to this effect to the President pro tem and the Speaker, the Vice President immediately assumes the powers and duties of the office as Acting President. If the President, at a time of his choice, transmits a written message to the President pro tem and the Speaker that no disability exists, he or she resumes office. The Vice President and a majority of the Cabinet or disability review body may, however, contest this finding by a written declaration to the contrary to the aforementioned officers, delivered within four days of the President’s declaration. Congress then decides the question, assembling within 48 hours if it is not in session. If Congress decides by a two-thirds vote of both houses that the President is unable to discharge the duties of the office, the Vice President continues as Acting President until the disability is resolved. If the two-thirds margin is not obtained, or if Congress is in session at the time but does not vote on the question within 21 days of receiving the requisite declaration, then the President resumes the powers and duties of the office. Similarly, if Congress is not in session at the time, and assembles as required by Section 4, but does not vote within 21 days of the day on which it is required to assemble, then the President resumes the powers and duties of the office. Section 4’s complexity and concern about its potential for misuse have raised questions among some observers that it could be implemented for political purposes. During debate on the amendment, its authors and proponents largely rejected such claims. They insisted the section was not intended to facilitate the removal of an unpopular or failed President, in support of which they cited checks and balances incorporated in the amendment that were designed to prevent abuse of the procedure. To date, Section 4 has not been implemented. 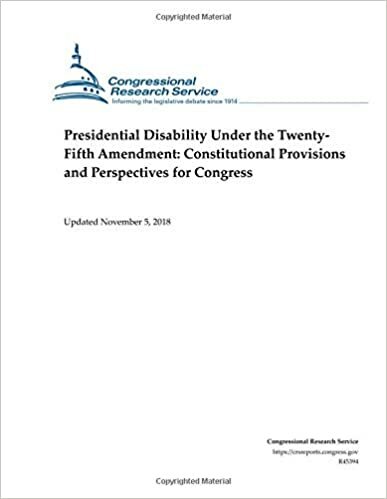 Two bills pending in the 115th Congress would establish a presidential disability review body as authorized by Section 4 of the Twenty-Fifth Amendment: H.R. 1987, introduced on April 6, 2017, and H.R. 2093, introduced on April 14 of the same year.